And so the hangover of defeat begins to dig deeper into our Bear-fan souls. After the debacle that went down on the field at Lambeau last night (final score 23-10), it’s not great to be a Bears fan this Friday. As the Bears sit 1-1 in the NFC, the question of – just HOW good are the Chicago Bears this year? – lingers in the back of our minds. The season opener against the rookie quarterback Andrew Luck and the Indianapolis Colts went so well, Chicago fans were riding a 4 day high thinking the Bears could make an early presence in the division and then we headed up to Green Bay and watched the Bears offensive confidence crumble into a million pieces of cheese. 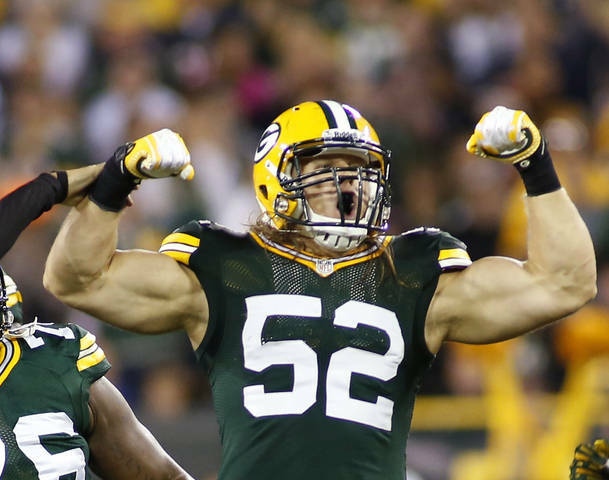 Clay Matthews (who is undoubtedly one of the best linebackers to ever play the position) pillaged, ravaged, and destroyed the Chicago Bears offense – specifically left tackle J’Marcus Webb. Cutler was sacked 7 times (3.5 delivered personally from Matthews), finished with 11 completions on his 27 attempts and threw 4 interceptions. Those are some real bad stats. Part of the problem was Cutler’s cocky trash talking throughout the week wishing the Packers defense “luck” – which came back to bite him right in the a&%…”Heard some talk out of the Bears: Packers secondary not working coverage, bigger receivers … we heard about it,” veteran safety Charles Woodson told ESPN’s Rachel Nichols after the game. “We understand that Jay is excited about his new weapons (referring to Brandon Marshall and rookie Alshon Jeffery), but it’s the same-old Jay. 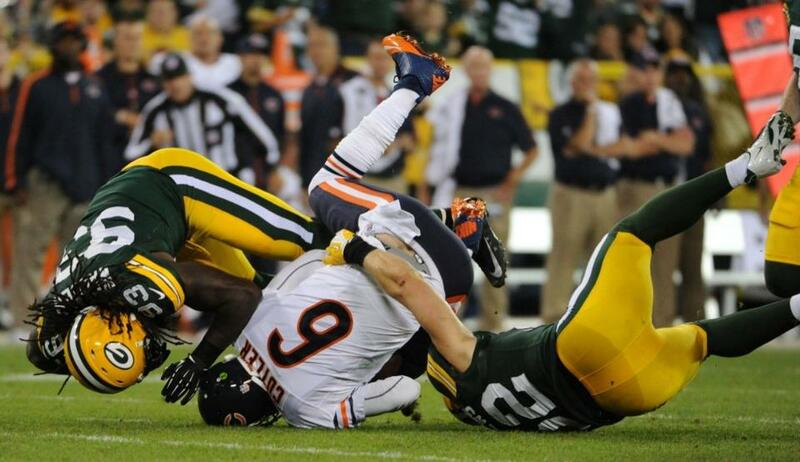 We don’t need luck; Jay will throw us the ball.” Lambeau field is like Jay Cutler’s kryptonite as a Chicago Bear. Cutler played REAL poorly, but he is not to blame for all the wrong doing. The offensive line needs to block for their quarterback. Linemen are enormous SOBs and they need to do the job they get paid handsomely for. Also, when the offense is having a tough time to begin with, how about we avoid all the false starts (cough cough Webb). The O-Line was horrendous, however, Cutler needs to learn how to get rid of the ball and not take a sack for a loss of yards. Quick-short passes can be your friend Cutty. Our much anticipated receivers need to do their job – catch passes. Brandon Marshall our talented addition to the offense cannot drop a catch-able pass in the end zone. Earl Bennett needs to come up on the ball, not drift back and get beat out by his defender resulting in a Jay Cutler interception. Where are Chicago’s trick plays? That sneaky faked field goal with the GB special teams was slick and not one person on the Bears saw it coming – perfectly executed. Last night Lovie Smith and his staff got out coached…once again. 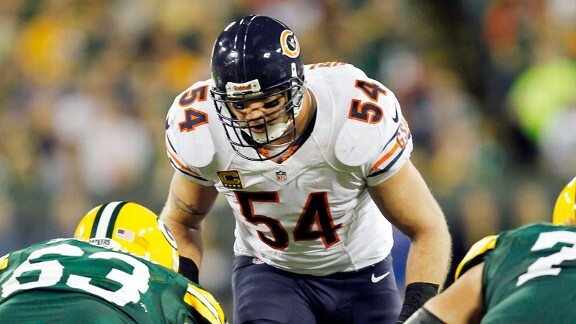 I would agree with Urlacher, we have a long way to go just yet, but no need to pout it was only game two! Green Bay is a well oiled machine with great chemistry and we’ll get another shot at them later in the season. Hopefully Matt Forte’s game ending ankle sprain isn’t serious – fingers crossed. Shake it off, rest up, and let’s take care of St. Louis in game three.